When I signed up for this, I didn’t think my chances of making it were all that good. I thought, best case scenario: I’d schedule my Sunday workout for Jets’ kick-off and most of the time they’d be well on their way to losing by the time I finished — it’d be easy enough to skip those games — that and I’d obviously fold and watch both Patriots games and almost certainly develop (yet another) unhealthy relationship with Madden. I said yes because the Jets are woeful enough for this workout scheme to be successful, because I’m so worn out from the clown car we’ve become under Woody Johnson, so much so that a huge part of me wishes it were socially acceptable to simply follow Rex to Buffalo. I said yes because Addy asked and he’s my ride-or-die homie — he gave me a place to live when I was at my lowest and homeless, twice — and I would run through a brick wall for that dude. I could easily try and not watch the Jets for season. But a tiny wrinkle I found early on in Against Football quickly became this rabbit-hole inside which I found a real sense of purchase. I’m going to make it. I’m not going to watch football this year, I’m damn near certain. There’s nothing really new in this book, not if you’ve been paying attention. Rather, it’s a full-bore, fire-hose barrage of it, years of whispers and fleeting, single reports — usually squeezed between highlights and commercials — here concentrated and backed up with the sort of breadth of evidence short-form news reports do not provide. It’s a chapter-by-chapter survey of everything that’s toxic about football (the majority of which are cataloged on our Breaking Up Is Hard to Do page). But it is all presented by one of us, by a genuine football fan, by a human being and an active well of empathy struggling his way through digesting this all; meaning we get Steve Almond’s reaction to each toxicity along the way, along with several instances of the slippery logic employed by someone who’s found solace in something he knows he should be ashamed of. And that had its effect, to be sure. It’d be near impossible to engage the book with any sort of earnestness and not walk away knowing that the game in its current state is killing its players, and that the NFL’s insistence on ever-increasing profitability actively makes this worse, and, most of all, that by even passively consuming this, you are indeed part of the problem. The rallying cry of the perennial loser: At least we’ve got talent! Three years ago, with then-San Francisco 49ers kicker David Akers landing the ball everywhere but between the uprights, I’d scurry into my bedroom and hide under a blanket whenever he trotted onto the gridiron for a high-stakes field goal attempt. 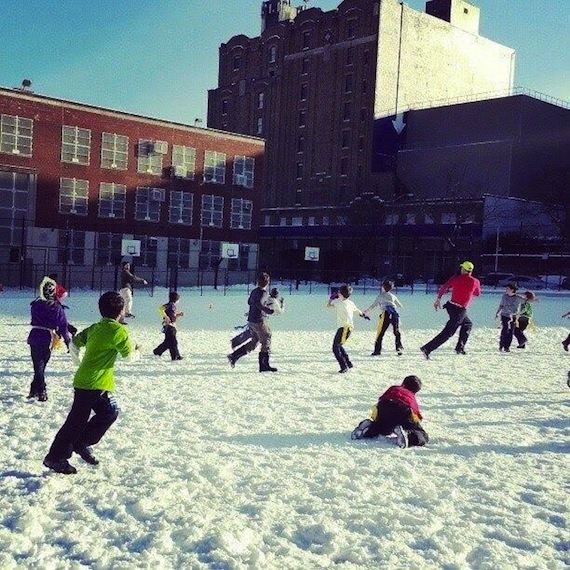 An outburst of cheering — provided it was a home game — meant success. In my more fragile moments, however, I’d mute the television and refresh Twitter for game updates. I don’t enjoy 49ers games so much as I survive them, and mediating particularly tense situations through a mobile app kept me more or less on an even keel. I got used to following live feeds of the game because, for a while — living in New York City and watching TV via high-def antenna — it was difficult to see 49ers games at all. Only recently did the team start performing well enough to warrant nationally-broadcast games. Still, I needed my fix. I never enjoyed watching football with a bunch of strangers, so I avoided sports bars. I soon discovered FirstRowSports, a site collecting low-res, illegal, live streams of NFL games — though I had to install a sketchy-looking driver to use its video player, a fee I gladly paid. Eventually, U.S. Immigration and Customs Enforcement seized the site’s domain, which now routes visitors to this ominous anti-piracy PSA. Since then, FirstRowSports has re-launched, presumably it is hosted in a country unlikely to be raided by the U.S. or its allies. I justify my decision to circumvent NFL-approved broadcasts by saying it’s for moral reasons, similar to the issues Steve Almond articulates in Against Football. I refuse to support a business that presents itself as a purveyor of wholesome, All-American family fun, but that is — even overlooking the concussion issue — greedy and cynical. The NFL cares about breast cancer only inasmuch as the disease will increase female viewers. Salute the troops? Sure, for a price. 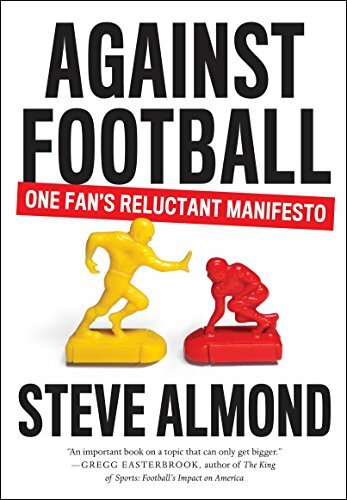 For the NFL pre-season, Football Book Club will be reading Against Football: One Fan’s Reluctant Manifesto by Steve Almond. For more on Against Football, check out these pieces from The New York Times, NPR, and The Millions.